Kreators (1 person Hallyu content creators) came to visit Korea last October to join the 'Kreator 2016'. The event was held during the 'Korea Sale Festa', was sponsored by the Ministry of Culture, Sports, and Tourism, and co-hosted by KOFICE (President Young-Jin Kwak) and GoodTimeWith.me (GTW). 'Kreator 2016' invited global creators who act as 'influencers'* in the rapid spread of Hallyu. The event intended to build a network with ‘Kreators’ whose influence is growing among viewers thanks to their huge popularity and interactive content creation. *Influencer: Individuals who have an influence on society. The term 'Kreator' is a compound of 'Korea' and 'Creator' (1 person content creator) that refers to the creators of Hallyu content and Hallyu promoters. During the 'Kreator 2016', 6 global Kreators invited from English, Spanish, East Asian, and Chinese speaking regions traveled to Seoul, Daejeon, Jinju, Busan, and Gangwon (Jungsun) discovering the exquisite cultures of Korea. 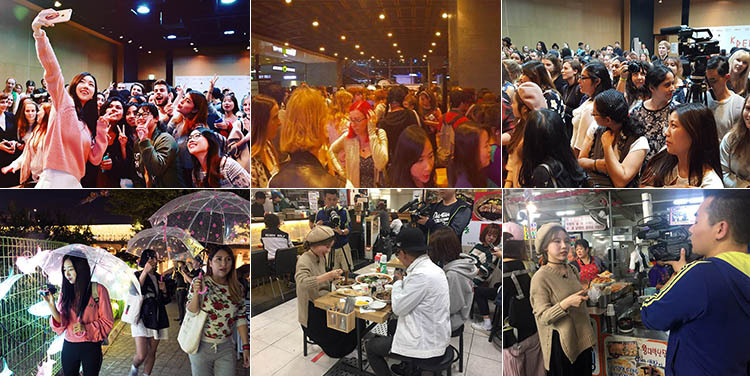 During the 'Kreator Week' event, Kreators were appointed as Hallyu ambassadors, received 'Kreator Award', and had a 'meet-up' with hundreds of fans. Videos of 'Kreator 2016' made by the Kreators will be released from the 2nd week of October on each Kreator's channel (YouTube).